"...love what you and Michael did with "I Can't Make You (Love Me)"...tremendous work Rob." These tracks were mixed and mastered independently from the CD tracks specifically for Hi-Res Download by Cookie Marenco. 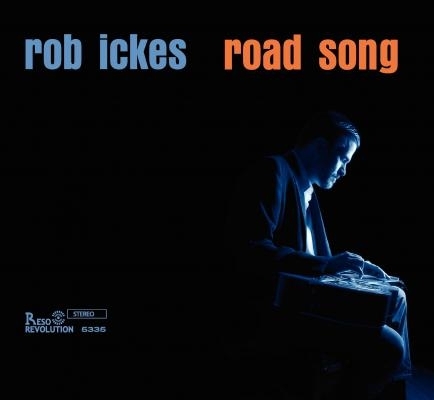 Rob Ickes’ fifth solo album is a boundary breaking album with wondrous romps and intimate dobro-piano dialogues that reach into the emotional core of 10 great jazz standards. Jazz pianist Michael Alvey's intricate bass lines and percussive right-hand chordal punctuations have the energy of a full ensemble, while Ickes lays down melodies with precision before the duo launches into breathtaking improvisational rides. Robinella, a perfectly empathetic singer, contributes a playful give-and-take with dobro and piano, partly inspired by the great Ella Fitzgerald-Louis Armstrong collaborations. The 10-time winner of the Dobro Player of the Year award from the International Bluegrass Music Association, Ickes isn't content with assumed boundaries of genre. Throughout his career, as a solo artist, a sought-after sideman or a founding member of the acclaimed ensembles Blue Highway and Three Ring Circle, Ickes' intuitive ability to tap into a song's emotional essence and offer something fresh has earned him accolades and respect well beyond the Dobro's domain in country and bluegrass music. 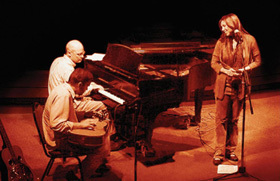 Ickes (rhymes w/ “bikes”) has collaborated with a wide range of musicians, including Charlie Haden, Merle Haggard, Earl Scruggs, Tony Rice, David Grisman, Alison Krauss, Willie Nelson, David Lee Roth, Patty Loveless, and Mary Chapin Carpenter. The youngest dobro player on The Great Dobro Sessions (1994 Grammy, Best Bluegrass Album), he was also on the Alison Krauss & The Cox Family album, I Know Who Holds Tomorrow (1994 Grammy, Best Southern Gospel)..
For the first release on my own label, ResoRevolution, I wanted to do something somewhat "revolutionary" in the resonator guitar world. I think it is safe to say that this is the first time that piano and Dobro have been paired together for an entire CD. I have always enjoyed the way the natural sustain of the Dobro blends with the longer and more complex chords that piano players use. These chords effectively give me more notes to choose from, expanding the voice of my instrument. This recording was made as "live" as possible. Michael and I went into the studio for two days and just sat down and played. That's the way I like to record, to capture what happens between musicians. There were minimal fixes on this recording, and each of Robinella's songs are first takes; thank you, Robinella and Michael, for these great performances!